It's time for another FSJ Creative Team Blog Hop! I am excited that we are sharing with you items from the new release, Easter Blessings. The new products I get to share are my FAVORITE things in this new release; the Sweet Home Accents Die Set. This set is designed to go with the Gable Favor Box, from the last release in December. I love that I now have fun new dies to use with my Gable Favor Box to turn it into a house. If you are not familiar with the Gable Favor Box die set, check out my blog post featuring it HERE. You can see the Sweet Home Accents Die set below, a set of 9 dies. There are so many cute things you can do with these dies and I am excited to share them with you today. I have created 5 different houses with this set and the Gable Favor Box. So, let's take a look. And if you scroll down you will also find a video introducing this die set and showing it use. I really had so much fun making these little houses! And when I realized I could use my Winter Build-a-Scene dies with it for the roof and fence I was thrilled. The printed paper I used on these boxes is also from this release, it is the Create and Bloom Prints pack, check out my video to see all the prints, and I have linked it with all the products at the end of this post. Next up is the Orange house, it might be my favorite. Look at the little kitty in the window! And the gingham roof. I also used the Border Basics die set for a few of the roofs. Any scallop die or punch could be used to make the roof for these houses. I partially die cut the large rectangle die from this set to create a door that opens and closes. Most all the the elements added to the front of these die cut boxes are doubled or tripled up to make them more sturdy. You just die cut two or three of the same piece, glue and stack them together to make a thicker element. This gives them a more 3D look. For this yellow house I cut the rounded window die apart, saving the rounded part for the window on the door. And if you watch the video you can see how I made the chimney on the orange and yellow houses, using the flower pot die. All of the door knobs on the houses are gems from the All The Things accessory pack. I love that I was able to do a rainbow of houses and use just one accessory pack for all the doors. I guess that's why it's called "All The Things". The other thing I love about this die set is the tiny heart that comes in it. I love a tiny heart die. I need them in every shape and size really! I mean who doesn't!?! For this house I used the bottom half of the rounded window only, cutting off the rounded top. The curtain piece is from the Winter Build-a-Scene die set. And, I did some partial die cutting to get the rounded door. And I have to say, this plaid paper is my FAVEorite print int he Create and Bloom prints! There was not a print in this pack I wanted to use for my blue house, so I brought out the Buffalo Check stencil. I mean who does not want to live in a buffalo checked house? RIGHT!?! This house is like the DIY, upcycle, reduce, reuse, recycle house. I saved the little negative pieces from the rounded window; the squares and the tear drop shapes. I then tiled the roof with the squares and I made a flower with the raindrop shapes. Waste not want not. And I am now feeling like I am part of the tiny house movement! Have you noticed that my windows are backed with Vellum? I love that added touch to the windows. And if you'd like to see how I made these boxes check out the video below. If you do not already follow me on YouTube, make sure you click over to watch this video on YouTube and subscribe to my channel. You can also ring the bell to be notified when I post new videos, which is once a week. If you enjoyed this video give it a thumbs up. I hope you are inspired and will create some of your own houses with these fun dies. All of the products I used to make these houses are linked for you at the end of this blog post. If you make a house, I'd LOVE to see it! Now it is time to hop along and check out the other projects created with the Easter Blessings release. From here you are headed to Christine Chan's blog, Love of Sparkles. Here's a little sneak peek of what you are going to find there, also using a new cute little die set! We'd love it if you'd leave a comment as you hop along and let the designers know what you think of their projects. I appreciate you taking the time to stop by my blog and let me share my creations with you. I hope you come back again soon. Here are all the products I used to make Gable Favor Box houses. Affiliate links have been used at no cost to you. I appreciate your support! YAY! It's time for another FSJ Creative Team Blog Hop! December's Blog Hop is all about Christmas finishings, tags, cards, ornaments, etc. I had to make some woodland critter ornaments. My daughter got a felt animal kit for her birthday and we had a lot of fun making the animals in the kit. After that I stumbled upon some woodland animal dies from Spellbinders. Hannah and I decided we needed them to make some more felt animals. And they arrived just in time to turn create Christmas ornaments with them. Let me share some tips and tricks for making these cute felt ornaments with you that I learned along the way. First of all you will want to buy some higher quality felt. I got my felt at Hobby Lobby and it is 2mm thick, much thicker than the felt I normally get for kids craft projects. This felt was 78 cents a sheet, but 50% off! I got two sheets (8-1/2" x 11") each of the colors I thought I might need. Second, buy some coordinating embroidery floss. The felt die cuts very easily with the dies I used because they are steel rule dies. But because this is thick felt it may be hard to cut more than one layer of felt at a time. This owl was die cut with the Who's There Steel Rule Die. I cut two of each piece on the die except the heart. And the holly is from another die set, Reindeer. First step for the owl was to stitch the elements to the top piece; the eyes, wings and heart. I did this with a running stitch, going around each element twice to fill in the spaces between the stitches. The feet, holly and beak are hot glued on. I did double up the beak, hot gluing one beak on top of the other. It just seemed like it needed to be thicker. NOTE: I did all the hot gluing once the owl was all done. Then I laid the two owl piece back to back and did a blanket stitch around the outside, I like to do this stitch when my die cut pieces do not have already pierced holes in them as a guide for stitching. I left and opening in the two pieces and filled the owl with polyester fiberfill and then continued to stitch the owl closed. I added a bit of Candy Apple twine to the top for a hanger. The bunny is done much the same way as the owl, using the It's a Bunny Thing Die, but I do have a couple pointers. For the ears, die cut two pieces and then overlap them slightly and secure with a dot of hot glue. Do a running stitch around the ears as if they were one piece. Once you gone all the way around stitch back through your holes, filling in the open spaces. So there are no spaces between the thread. Set the ears aside. Add the eye to the bunny with a tiny dot of hot glue and then add a french knot to the black eye, giving it some life. Lay the two bunny pieces together. Blanket stitch them together, but when you get to the spot where the ears will go, only blanket stitch the top layer of the bunny. This leaves an opening for you to hot glue in the stitched ears, but the top of the bunny will have that continuous blanket stitch. Before gluing in the ears, add some stuffing and then hot glue the ears to the front and back of the bunny, closing him up. Hot glue on the pink nose and holly. For the tail, blanket stitch around two tail pieces. When you have a small gap left stuff the tail, finish stitching the tail closed and hot glue it to the bunny. Add a piece of twine to the back for a hanger. I had some fun with the fox! He might be my favorite. I did use two elements from the Owl die, the feet to make paws for the fox and the heart. I love that I can use elements from the other dies for more options. The fox die, Hey Foxy, cuts one piece for the head and another for body. So, here's how I handled that. I hot glued the body to the head and used that as a guide to do the same for the back of the fox, so the front and the back are exactly the same. This way when stitching I can treat these pieces as a single piece. Before stitching up the fox, add the face piece with hot glue. And the heart to the belly with a running stitch, going around the object twice. Then add a french knot to each eye. Now blanket stitch the front of the fox to the back of the fox. Leaving an opening to add a bit of PolyFill. Then hot glue the tail accent piece to the tip of one tail piece, taking care to only use a dot. Then stitch the two tail pieces together, all the way around with a blanket stitch. Then hot glue the tail to the back of the fox. Lastly add the paws, die cut from the Owl die, and the holly with hot glue. Stitch on a pice of twin, but running a piece of twine with a needle through a couple of stitches in the critters head. The raccoon is die cut using the Bandit die, exactly as I did the fox. I love these dies so much that I plan to make some other critter ornaments using other materials to share with you soon. Below are the dies I use to make these ornaments, including the Reindeer die set that I used to make the holly. It is a thin metal die set, so my tip there is to run it through the die cutting machine a couple times to get a nice clean cut with it from felt. 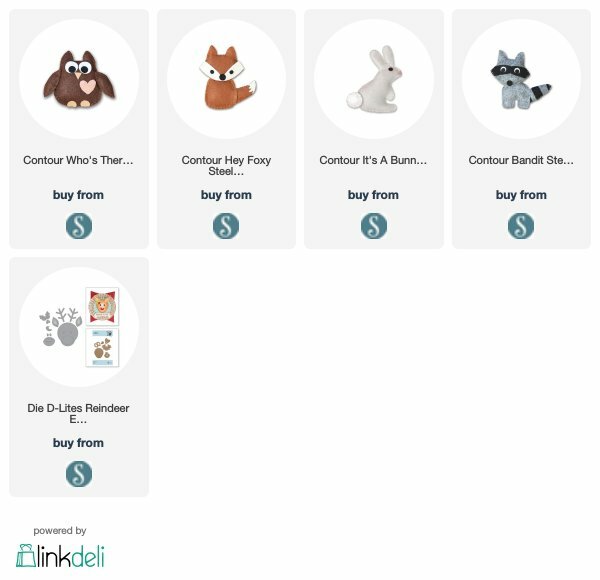 Click any of the dies to shop for them, NOTE that all the main critter dies I used are currently on CLEARANCE! Now you will want to hop along to the next blog on the hop, Love of Sparkles with Christine Chan. If you missed a link on the hop the others are listed below for you as well. We love it when you leave us comments, so don't be shy. Hello crafty friends and Welcome to the FSJ Creative Team Blog Hop! I’m so excited to be participating in the first blog hop for the new Creative Team at Fun Stampers Journey. Every month we will be bringing paper to life by using some of the amazing and colorful products from the FSJ line up! Today I am featuring the Happy Harvest stamp set and Paper Fan Die. Be sure to check out the list of blog hoppers below and visit each of the designers blogs to see what they have created for this hop. I think you will totally enjoy the creativity and talent that these ladies have! So, what did I make with my featured products, Happy Harvest and the Paper Fan Die? It's a fall door hanger. What a fun thing to make and get to look at each time I come in the door. And I hope it makes others smile and feel welcome too. Now let's take a look at each of the 5 paper fans on this door hanger and I will tell you what size paper I used to make that fan and how many you need to make it. Run each strip through the die cutting machine with the Paper Fan die, so that one edge will be scalloped. Fold the paper accordion fashion. Start one strip by folding down and the other by folding up. This will ensure that you can then glue the ends together. Once both ends are glued together put a puddle of hot glue on a 1" circle, press the paper fan flat on to that hot glue to hold it in place. You may need to squeeze a little hot glue down into the center of the fan to help secure it in place. Die cut these three pieces with the paper fan, so that one side will come out with a scalloped edge. To put the fan together repeat the steps above, this time using a 2" circle to put the hot glue on. Again, die cut these three strips with the Paper Fan die so that one edge is scalloped and repeat the folding and gluing directions above, also using a 2" circle to put the hot glue on. By now putting together the fans should be getting easier. But if you are a visual person here is a video on how to make these that my friend, Michelle Woerner at FSJ made. To color my scarecrow I use the Journey Color Burst pencils. Below I have listed which pencils I used for each element (the Color Burst pencils are each numbered, I have listed the number on the pencil for easy reference). To adhere all these fans in one long strip I use chipboard. First cut two strips of chipboard to be 1-1/2" x 12". Mark one of these at 4 inches. Glue the two together lining them up at the four inch mark, leaving a 20" long strip of chipboard. To make the hanger cut a piece of ribbon to 12" and loop it, hot glue the loop to the top fo the chipboard. Then begin hot glueing the paper fans to the chipboard. Before adhering the last fan, cut another piece of ribbon to 6", fold it in half and hot glue it to the bottom of the chipboard. Now glue on the last paper fan. You are now ready to hang your creation on the door. You can recreate the Paper Fan Door Hanger for any occasion; Winter, Christmas, Easter, Halloween, Valentines Day, a birthday, new baby, graduation, etc. For your convenience I have listed all the products I used below. Two things are not on this list, the wooden leaves, those are an FSJ Bloom Benefit, which means they are a FREE gift when you spend $75 on FSJ products. Claim them at check out, they are called Golden Leaves. Second, I did not list the Chipboard here, I save up chipboard I get in packaging and repurpose it for projects like this one. Now it is time to hop along and see what the other designers have created for this months blog hop. Be sure to leave comments along the way and let them know how much you love their project. Next up in the Blog Hop Christine Chan, you are going to love her attention to detail in her beautiful project. Click HERE to hop on over to Christine's blog, Love of Sparkles, to see her mixed media project on Canvas. If you got lost on the hop, here is the entire list of links to the Blog Hop. You can also find the official blog hop list on the Fun Stampers Journey blog, HERE. I hope you have found inspiration to create while on my blog today, please let me know if you have any questions. If you make a project inspired by the one I shared here today, I'd love to see it! It's time for another Designer's Showcase Blog Hop. This month the designers are sharing Valentine projects. My project is a treat bag with a topper and tag made with the Bug Love Hostess set from the just released Bloom This Way Catalog by Fun Stampers Journey. This Bug Love set is seriously growing on me! The are so whimsical and fun. Plus, I love when a stamp set come with it's own sayings! And this one has three! I used a a couple of dies to accent this project, the Create A Bow Mini Die set for the bag topper and the Heart-Felt die set for the heart in my tag. I also used two different background stamps on this tag. For the topper I stamped a piece of Whip Cream card stock with the Flannel Life background stamp in Candy Apple Red. And on the heart I stamped the Deco Dots stamp with Clear Pigment ink and embossed it with Clear powder. I love the tone on tone look here with the contrast of the matte paper and the shine of the dots! I love giving little cute things out for the holidays. People like our kids teachers, friends, neighbors, the UPS man, etc. need to know they make our lives better and what better way and with a little hand made gift. Next up on the blog hop is Angela Kelley. If you are lost on this blog hop or a link did not work for you, here is the list of blogs for this hop. Thank you for hopping along with us, be sure to leave a comment and let each of the designers know what you like about their creations, we love to hear from you. Use your host dollars to get this set, when your order reaches $150. Shop HERE. View the Bloom This Way Catalog HERE. Get your own copy of the Bloom This Way catalog HERE for just the cost of shipping. Get the January edition of Coach Collective HERE. Check out the Spruce Up Your Space Sale! Welcome to the December Blog Hop of the Fun Stampers Journey Designer's Showcase. The Designer's Showcase is made up of 9 Journey Coaches who have been selected to showcase Fun Stampers Journey products in social media and create displays for their events. The theme of this months blog hop is Christmas Gift Tags. My gift tag features the die set, Ornament Swirls. It's a 3 piece die set that makes the prettiest ornaments. Below are links to all the products I used to make these tags. Next up on the Blog Hop is Sara Sherlock from Much Love click here to check out her Christmas Gift Tag. If you get lost along the way here are all 4 of the blog posts for this blog hop. Be sure to take advantage of Fun Stampers Journey 12 Days of Deals. Todays Deal is 30% off Albums and pages for your 6 x 8 Album. Check it out here. The December Coach Collective is NOW AVAILABLE! Get your collection of these 12 tutorials HERE. Thank you for taking the time to stop and visit my blog. Please leave some love and let all the designers know how you like their creations, we love getting your comments. Welcome to the second Designer's Showcase Blog Hop! Our theme this month is Planner Projects. I am very new to the world of Planners, but could not help but join this "movement" as Fun Stampers Journey has an amazing line of planners and fun planner products. Check them out HERE! My planner is the A5 size, it's a larger size planner, I like to write a lot so I felt this was the best fit for me. I decided to use what I have, which happens to be extra pages for my planner. I started my planner mid way through the year and have past months that are unused. I didn't want to waste these pages, so I decided to repurpose them and make a Fall Dashboard for my planner. My dashboard has a window and pockets on both sides. Here's how easy it was to make. I cut a piece of 12 x12 printed paper to at 5-3/4". Then cut it at 8-1/2". The longer piece is what I adhered to the unused planner page. The smaller piece became the pocket. I used two pieces of printed paper from the Fall Fest Prints from the Journey Holidays Mini Catalog. I used two different prints for my pages, and when I cut the paper I flipped the smaller piece over so my pocket showcased the print on the other side of the paper. Before adhering my pocket to my page, I die cut part of a circle in the center of the top edge of the pocket and stamped over the print with the Canvas Print background stamp. After adhering the first large piece of printed paper, I adhered the pocket, only putting adhesive on the short outer edge and bottom edge. I did not put adhesive on the edge that would be where the holes get punched. This give the pocket room to open up and expand for the things I'm going to put in it. Once the first side has the paper and pocket on it, I flipped it over and used the planner page as a guide to punch out the holes with a hand held punch. Once all the holes were punched I was able to adhere the second piece of printed paper to the back, as well as the pocket. Taking note not to put adhesive on the side where the wholes would be punched into the pocket or on the top of the pocket. Since I already punched the wholes for the first side of my page I can again flip this page over and used those holes as guide to punch out the holes and my page is now able to go into my planner. But I did not stop there. I added a window into my dashboard with a leaf die from the Hello Fall Bundle. Since I was die cutting through multiple layers of paper, I ran it through my Platinum Die cutting machine twice to ensure a nice clean cut. I still felt the page needed something, so I stamped and die cut two of the leaves from the Hello Fall bundle and adhered them to the bottom left corner of the front of the page. But, I did not stop there, I also made three planner clips to match. DIY Planner Clips are quite easy to make. To make two clips I needed 4 circles. I used the smallest circle and piercing circle from the Circles Dies for the circles that will be on the top of the clip. For the circles that will be on the back I did not use the piercing die. One of the circles I die cut from a print I created on my Gel Press. I used Red, Orange, Pink and Gold acrylic paint, brayered on my Gel Press. To get the texture in my paint I used a plastic produce bag wadded up and pounced it over the paint. Then I used a piece of Whip Cream card stock to pull up the paint, creating this print. I stamped an die cut an acorn for my printed circle and I die cut a leaf shape from the print and stamped on it for my brown circle (brown ink pad and card stock are Hazelnut Blend). I glued these elements down on the circles and then covered them with Journey Glaze. Since these circles have tiny holes all around the edge I put the circles down on left over piece of paper that foam squares come on, then if Journey Glaze gets on that paper it will peel off very easily. These need a good amount of time to dry, especially since I got the glaze pretty thick on the leaf circle. So I started working on back side of the clip. I wrapped the top of a jumbo paper clip with a piece of Liner Tape (double sided sticky tape). Then I stuck the paper clip to the back circle. I surrounded the paper clip with foam squares to hold it in place. Then I took a piece of Natural Twine and separated the strands of it, turning it into three skinnier pieces of twine that look more soft. I stuck one strand to the foam squares, in small circles. To ensure the twine stays and that I had enough adhesive to stick the top circle on this I covered the twine with some Liner Tape. Now the back of my clip was ready for the cute top piece, once it was dry. I made a second clip, this one one is turned on it's side. I started with a piece of Hazelnut Blend card stock that measured 1-1/2" x 2" scored at 1", or in half. I cut a small strip of my Gel Press Print, 5/8" x 1-1/2", and stamped Hello Fall on it with Hazelnut Blend ink. The tiny acorn is cut from the Fall Fest Prints paper. I adhered these piece to the front of the paper and then covered the inside with Liner tape. Then I slipped the paper into the paper clip and adhered it closed. I tied on the last piece of the separated twine and covered the acorn with Journey Glaze. Three planner clips to match my fall dashboard done. I took a little bit of time to dress up my planner for the fall season and I have to say it makes me more excited to really use my planner. And since I recently double booked myself I think it is time I really start using it. Something about the act of writing down an appointment or event really helps me to remember it. Next up on the Designer's Showcase Blog Hop is Kim Sinclair with some cute pockets for your planner. If you get lost along the blog hop, here is the complete list of Designers on the blog hop. You can find all the products I used to make my planner dashboard below. Click any of the images to view it in my online store. Thank you so much for hopping along with us, please feel free to leave comments on the projects as you go to show some love for the Designer's. And let me know if you have any questions, I am here to help! If you love planners and making your own fun planner things or if you love a great sale. Check out all of these planner products that are currently 25% off! Get the October Coach Collective for FREE when you shop with me! I will email you this collection of 12 tutorials when I get your order confirmation. I love a good mystery, a mystery swap that it. I am playing along with the Mystery Swap Blog Hop at SSINK today, Eeeeeee! There's fun stamping and you get to hop along and enjoy all 6 of the swap creations. As you hop along, please be sure to comment and show some love on every blog! We are always excited to hear from our followers! You should have just left stop number #2 on the Stylin' Stampin' INKspiration Blog Hop - Diana at Stampin' Fun with Diana. If so, you are in the right spot. If a link doesn't work or you get off track, you will find the full blog hop lineup below. Here's how the Mystery Swap works. Each participant in the swap mails 3 things to their designate person. These items should include a stamped image, accessory and paper. You can vary this however you want as long as there are 3 pieces. I received these three items from Diana Eichfeld. The saying was on a square of whisper white card stock and I die cut it into this oval shape and then realized I did not take my "before" picture. I felt like the dark brown of the Early Espresso designer paper and the fun pinkish purple color of the Sweet Sugar plum ribbon would make a great baby card. And the "congrats" sentiment would go perfect with my baby card idea. So I pulled out my Baby Bear stamp set. Don't you LOVE the photorealistic style of this set! You stamp three separate image on top of each other to create the bear. I used three ink pads for this bear; Crumb Cake, Chocolate Chip and Early Espresso. I used the ribbon in two places on my card. One for the bow on the bears head, which was my friend Tami's idea! I love it, it gives her such a sweet vintage look. And here is the other piece of the Sweet Sugar Plum ribbon, a little accent for the sentiment. I also added a scalloped oval behind the sentiment for a cute border. What a fun swap. And we want you to join in the fun! Hop on the blog hop and check out the other creations in this swap. Next on the blog hop is #4 - Tobe at The Craft Sea. It's time for another Mystery Supply Swap with Stylin' Stampin' Inkspiration! And this month at SSINK we are doing a blog hop, so you can see all the swaps. Fun! As you hop along, please be sure to comment and show some love on every blog! We are always excited to hear from our followers! You should have just left stop number 4 on the Stylin' Stampin' INKspiration Blog Hop - Donna at Geek Squad Crafting. If so, you are in the right spot. If a link doesn't work or you get off track, you will find the full blog hop lineup below. The Mystery Supply Swap is a unique swap because we do not swap finished cards but instead send pieces that can be used to make a card. Like ribbon, buttons, designer paper, stamped images, etc. Here is are the Mystery Supplies I was sent by Tonya Bell. I love that she gave me a spider web doily with snowflake paper, what a fun challenge! Here is how I altered the spider web doily to make a Christmas card. I cut the doily apart like this and intended to use the back of the doily, as it is white. But as I got to creating I changed it up a bit more. See the black doily peeking out from behind other elements. In addition to the Winter Wonderland Designer Paper, White Satin Ribbon and Spider Web doily that Tonya send me, I also used; Gold Glimmer paper, Gold Metallic Button, Snowflake element and Gold Foil paper. I love adding fun accents to my cards and the new Snowflake elements are so cool! Both of my girls independent of each other saw them and asked me if they could keep them or if I could just get them their own package. That is exactly how you'll feel when you see them! The stamp set I used is call Peaceful Pines. I stamped the tree in Versamark ink and embossed it with Black embossing powder. This stamp set has a set of framelits that coordinate with it. I did not use them on this card, but you could use them to die cut the tree, or use them on their own to die cut tree shapes. I mention it because they are on sale until 11/16/15! Thanks for hopping over to my blog. Click the NEXT button below to continue on the blog hop and see more of our Mystery Supply Challenge. Welcome, if you are on the SSINKspiration blog hop you have just come from Cynthia's Blog. As you hop along, please be sure to comment and show some love on every blog! We are always excited to hear from our followers! You should have just left stop number #9 on the Stylin' Stampin' INKspiration Blog Hop - Cynthia at Ink-A-Doodle Creations . If so, you are in the right spot. If a link doesn't work or you get off track, you will find the full blog hop lineup below. Right now when I think of flowers I want to use my Indescribable Gift Stamp Set. So, I have another Indescribable Gift card to share with you today! For yesterdays card I used a watercoloring technique with this stamp. Today, I embossed the focal image with black embossing powder. Then I colored in the image with markers. Pretty easy. I like to emboss images and color them because the embossed edge hold the marker in making it quick and easy to color with out going out of the lines. I used two shades of each color, so I could color the image a light color and highlight it with a darker color. For the flowers I actually used three colors! I colored them with So Saffron added some Daffodil Delight and then highlighted with Hello Honey. For the leaves I used Pear Pizzaz and Mossy Meadow. For the Branch I used Crumb Cake and Chocolate Chip. Hungry yet? I love the names of our colors, so yummy! If you have not seen all of the blog posts on this blog hop, click the next button below to start the tour from the beginning. Thanks for visiting my blog! For more inspiration, shopping and to view our catalogs, visit my website. Don't miss out on my PAPER PUMPKIN GIVEAWAY! Today I am participating in the Creative Blog Hop. In order to participate in the Creative Blog hop you have to be nominated by another Stampin' Up! demonstrator. I was nominated by Linda Vich, a demonstrator from Manitoba, Canada. She found me on Pinterest! How sweet of her to nominate me! I was very excited to play along in the Creative Blog Hop. For this special occasion, I have created a Best Day Ever Double Berry Basket Ensemble. It all started with the Double Berry Basket. I die cut 2 Berry Baskets, which is 4 base pieces from the die from Whisper White card stock. I also die cut 4 base pieces from the Best Year Ever Designer Paper. I lined my white baskets with the Designer Paper. Then I attached them side by side. Here's how. Use a piece of card stock that is 2-3/4" x 6-1/2" as a base for the baskets to sit on. Put a square of glue on the bottom of one box and place the base piece on top so that is has a border of box around it about 1/4". Meaning the base will not go all the way to the edge. Flip this over and add glue to the base sitting the second berry basket on the base right next to the first one. Here is what the bottom looks like when done. Last step in securing the baskets together is to staple them at the top where they meet. Then I added a the handle. I die cut two handle, one from card stock the other from Designer Paper, I glued them together, making the handle stronger. The handle is attached where the to baskets meet. Cover these with a cute bow made with the Bow Builder Punch. I also added a folded in half Doily to each end of the basket and one to cover the middle section where the baskets meet. Here is the Double Berry Basket! Now to fill it!!! For the first side, I made some MINI cards, each card is 2" x 2"! I made little envelopes to match them as well, using my Envelope Punch Board. To make envelopes for at 2 x 2 card you need to start with at 4" x 4" piece of paper. Score and punch all side at 2" on your Envelope Punch Board, it's that simple! For the second basket I made a set of gift tags with the Ornate Tag Topper Punch. I put the tags in a cello bag and tied them up. The cards and envelopes got their own bag and each went on one side of the basket. I super cute little gift. This cute gift had to have a card to go with it! Of course it had to have a matching envelope too! I had a great time making and sharing these projects with you for the Creative Blog Hop. Another fun part of the Creative Blog Hop is where I answer some questions about me. We recently moved in to a new house and I have a new big stamp room. I am working on getting it all set up, organized, decorated and such. I am also working on a paper bouquet for an upcoming class. It is a kit from the Occasion Catalog, but I am having fun putting my own touches on it. I love to play with different styles, so I would not say that I have one style. But I love to make cards with a lot of details. I love my cards and creations to have texture. I love to add embellishments like ribbon, rhinestones, buttons and I'm pretty sure that all my card uses dimensionals!!! I would say that I pay close attention to each detail in my creations. Most of my creations are for classes, workshops or for blogs that I design for. But, I create these things because I LOVE stamping. I love my job of creating things and sharing it with other people. I love teaching others about the art of rubber stamping and that you do not have to be an artist to make something cute. Usually I am inspired by something. Maybe another card I saw or a color combination. I pull out the things I know I want to use, maybe a stamp set or Designer Paper. Then I lay a few things out and see what it needs. I never adhere anything until I know where it is all going to go and I like how it looks. I guess it never goes the same way every time Sometimes a card is not turning out at all and I have to take a break and come back to it later. Then I have time to think on it and then the idea will come to me to on how to finish my project. But then again sometimes the idea never comes and I scratch it or start over and it all goes in a new direction. Each persons creative process is different and I bet pretty hard to put into works, other wise it would be science and not art. To end the Creative Blog Hop I get to nominate another demonstrator to participate. So, I am nominating Georgeann Manning. She is a Stampin' Up! demonstrator who is part of Carrie's Stamp Crew (my downline). I love her work, she is so creative and really knows just how to put colors and layouts together. Georgie (as her friends call her) is the moderator of the blog Stampin' Royalty, which Georgie and I both design for. Not only that but she is my dear friend. Be sure to check out her blog and visit it on Monday, February 23rd for her post for the Creative Blog Hop. Visit my online store to shop for Stampin' Up! products. If you have never put the Berry Basket together before here is a very helpful video. Today I am participating in my first every Blog Hop with the fun design team at Stylin' Stampin' INKspiration! The theme of this blog hop is the just released Occasions Catalog. I have choosen to focus on the stamp set Sheltering Tree! It's an all season set! Here is a close up of each season stamped with the Sheltering Tree Set. Here are all the super cool things I used to make these cards. As you hop along, please be sure to comment and show some love on every blog! We are always excited to hear from our followers! You should have just left stop number 10 on the Stylin' Stampin' INKspiration Blog Hop, Melissa's blog. If so, you are in the right spot. If a link doesn't work or you get off track, you will find the full blog hop lineup below. Click "next" below to start the blog hop over or start the blog hop if you are visiting here first.